Living Cocoon believes all of us can sleep in a cocoon of luxury. We are simple folks who were once considered cool enough to work with top home designers. Now, we are just like you trying to watch TV laying on couch with a luxurious handcrafted quilts and throw keeping us cozy. Inspired by streets of Manhattan, the Manhattan quilt portrays the beautiful and inspiring architecture of the island and its fast pace city culture. Variety of different fabrics patched together in one celebrate cultural diversity of New York. 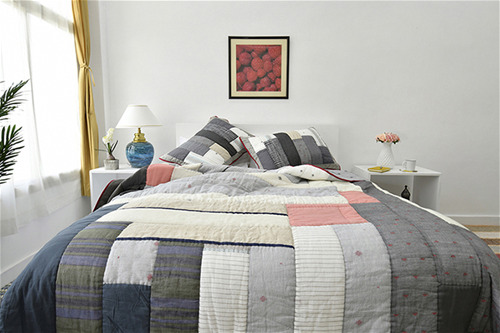 The quilt is backed by super cozy 100% handwoven Jamdani which will support all your dreams for making it in the big apple. Handmade by artisans in India. White and charcoal quilt refreshes your bedroom with a subtle and calm accent, without having to change the whole bedroom décor. Perfectly paired with a layer crisp white sheets underneath to give you a cozy and perfect sleep. Handcrafted by artisans to create a diamond frame with a square border.